Mobile phones emits radiation has been a common debate in the media. Even though the business sense, and of course, the utility has never let the news been blown out of proportion really. Going by the latest study, however, it is best for the patients of implanted Heart pacemaker to avoid keeping the smart phone closer to their chest. And also they should keep it on the other ear side (as opposed to the planted pacemaker) when connecting, or talking over the phone. It all happens because of the electromagnetic rays, being read as a heart signal by the machine. As a result, it might interfere with the normal functioning of the heart, creating a pause in the heart function. Such a circumstance might lead to fainting of the patient. 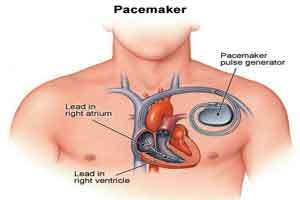 In extreme cases, the pacemaker may also interpret the signal as a life threatening signal, and can result in a shock. The US Food and Drug Administration, therefore, recommend use of smart phones 5-7 inches from the heart. However these studies are based on before the advent of smart phones also, that is in case of mobile phones. For the advocacy of mobile phones, the network standards have considerably improved over the last decade.